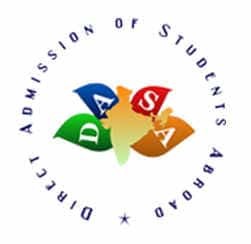 DASA 2018 is an admission process for those Foreign Nationals/ Persons of Indian Origin (PIOs)/ Non-Resident Indians (NRIs) who wants to seek admission in undergraduate engineering, architecture & planning programmes in government engineering and technical institutes (Centrally Funded Technical Institutes). Admission on the basis of SAT Subject Test Scores (Mathematics Level 2, Physics & Chemistry). DASA is the scheme under the supervision of Ministry of Human Resources and Development (MHRD) candidates living abroad who want to take admission in NITs, IIITs and other centrally funded technical institutions can apply for admission under this scheme via DASA 2018. The responsibility of carrying the admission process for Direct Admission of Students Abroad (DASA) for the session 2018-19 is entrusted upon VNIT Nagpur. The application process has started and the candidates can now fill the application form by following the link given on this page. Admissions in DASA 2018 participating institutes will be based on SAT subject test scores (Mathematics Level 2, Physics and Chemistry). SAT subject score is to be sent to IIIT Hyderabad electronically through College Board, USA. The code for college is 6997. Latest Update: The application process for the DASA has started from 2 March 2018. The candidates can now fill the application form by following the link given below. Minimum CGPA: Candidates must have secured a minimum aggregate of 60% marks or 6.0 CGPA (on a 10 point scale) or equivalent in the qualifying examination. Minimum SAT Score: Candidate should have a minimum aggregate score of 1070 (out of maximum 1600) in old format SAT, and also a minimum total score of 2000 (out of a maximum of 2400) in SAT Subject Tests in Physics, Chemistry and Mathematics. Candidates must note that both the SAT and SAT Subject Tests scores are mandatory. Candidates must be a Foreign Nationals/ Persons of Indian Origin who have completed the qualifying examination in any country (including India). Candidate must be an Indian Nationals who have completed his/her Class 11 & 12 or equivalent from outside India. DASA 2018 Application process has started and the form can be filled through an online mode. The candidates seeking admission in UG course are required to fill the application form. The last date to fill the form is 25 April 2018. Hence, the candidates are suggested to fill the form before the deadline. The link to fill the application form is given below. Online application: Candidates have to apply online at the official website and submit the required documents online (scanned and uploaded). No hard copy of the application or supporting documents needs to be sent. SAT subject test score: The candidates are required to send the SAT Subject Test Score to IIIT Hyderabad through College Board, USA (Institute Code 6997). The candidates have to submit the application form in order to complete the application process. However, before the final submission, the candidates are suggested to ensure that the details filled by them in the form are correct in all aspect. Once satisfied, then submit the application form. After submission, the candidates can keep the printouts of the application form with them for future reference. Application Fee - The candidates have to pay Rs 6000 as an application fee. The tuition fees for pursuing UG Course at the Participating Institute is USD 4000 per annum. Tuition Fee Waiver to the SAARC Countries: Foreign Nationals, who are nationals of SAARC countries, are eligible for 50% Tuition Fee waiver provided they have passed the qualifying examination in SAARC countries. DASA 2018 UG Admission will be done on the basis of their SAT and SAT subject test scores and the Institute choices given by them. SAT Subject Test scores received through College Board directly by the Institute before June 2018 will be considered for the preparation of DASA 2018 merit list and seat allotment. DASA 2018 Seat Allotment Result will be declared after the SAT scores are out. The candidates are therefore suggested to keep themselves updated on this page. In case of further Tie, candidates will be interviewed in person or over Skype to break the tie.DASA will not issue a separate seat allotment letter for the candidate. They need to check that on the website. No exam is conducted for admission through DASA rather admissions in the DASA participating institutes will be based on SAT and SAT subject test scores (Mathematics Level 2, Physics and Chemistry). SAT and SAT Subject Test Scores have to be sent directly via College Board. The score should reach the Institute. DASA 2018 Application Form - Registration Started!